Almost 100 years after her first creations, Chanel is still revered in the fashion world – and outside as well. In an era when products, thoughts and relationships are increasingly ephemeral, one should wonder why such a long stay. Freeing the woman from rigid attires at the end of the nineteenth century (which favored ostentation at the expense of comfort), Chanel reproduced, on an industrial scale, her own image – a distinctive image in absolute harmony with her personality and the historical moment in which she lived. And here lies the secret of her stay in the collective imagination for so long: we are not fascinated by her clothes, necklaces or perfumes – we are fascinated by her identity both strong and unique, which is revealed to us through the objects she used and (re)produced. 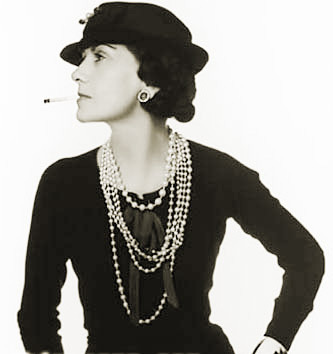 Some say that the intensity of Chanel’s presence annulled those of her rivals. It doesn’t seem to me, however, that this fascination came from the objects she chose to wear… On the contrary, such objects were personal and conscious choices, result of the intensity of her thinking – and of the understanding that, also by dressing, she expressed her own identity. Ironically, the industrial production of a unique personal style has become a paradox – to the point when Chanel herself stated: “I am no longer what I once was: I must be what I have become.” The desire for a socially recognized and valued image combined with the lack of knowledge and reflection on oneself make thousands of people seek in bags, shoes and clothes the ability to grant them personality and identity, in a total reversal of roles. As I once wrote in the text ‘About dressing’ (Jan, 2011), beauty lies in being and perceiving ourselves as unique. Beautiful, therefore, is not to own Chanel – beautiful is to be Chanel.